I just got a PP from Lowes and repotted it. It sits in a window. Today I noticed that its leaves have brown tips on them. Does this mean I gave it too much water when I replanted it or does it mean I haven't given it enough? I am a very bad plant owner. 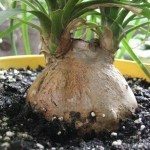 Ponytail Palm prefers drier soil, so allow it to dry out before watering again. Brown tips could just be some signs of stress from repotting or to much water as you mention. Make sure the plant is not sitting in soggy soil as this can cause the plant to rot. Here is a link to refresh you on care requirements.